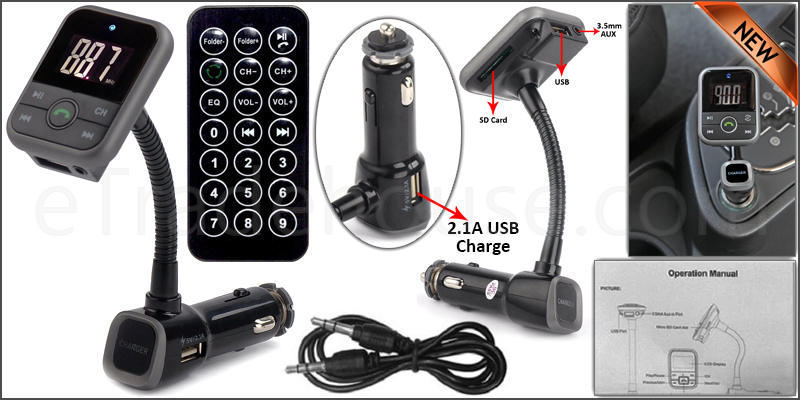 Wireless Bluetooth Car Kit FM Transmitter. Elegant Design with LCD Luminous Display. Includes USB and SD Card Slots. Supports USB and SD Cards up to 32GB. Built in 3.5mm Audio Jack Slot. Built in FM Transmitter, Supports FullFrequency: 87.5 – 108.0 MHz. Cigarette Lighter Adapter has a 2.1Amp Charging Port. Charging Ports Supports charging mobile,smart phone, GPS and accessories up to 2Amp. Plug the FM Transmitter into your Car Cigarette Lighter. Turn on your car stereo and tune to the same unused frequency as your car MP3 player. Insert a USB Flash or SD Memory Card which contains MP3 files. Line in Function: Connect the external music device with the aux cable. When using the external device, please stop playing USB or SD Card. 1x Wireless Bluetooth FM Transmitter CarKit. 1x 3.5mm Jack Aux Cable.